Medical symptoms Questionnaire (MSQ) score is an important functional medicine tool to assess patients initially & monitor your progress. The higher you score the severer your medical condition. • 20 or less is not clinically significant. • 20 to 49 indicates mild toxicity. • 50 to 99 indicates moderate toxicity. • 100 and above indicates severe toxicity. MSQ Scores also gives details of the body systems involved and how badly affect. This help the Functional medicine physician select priority focusing on the body systems severely affected. • Symptom score 1 when is mild and happens infrequently. • Symptom score 2 when mild but happens frequently. • Symptom score 3 when severe but happens infrequently. 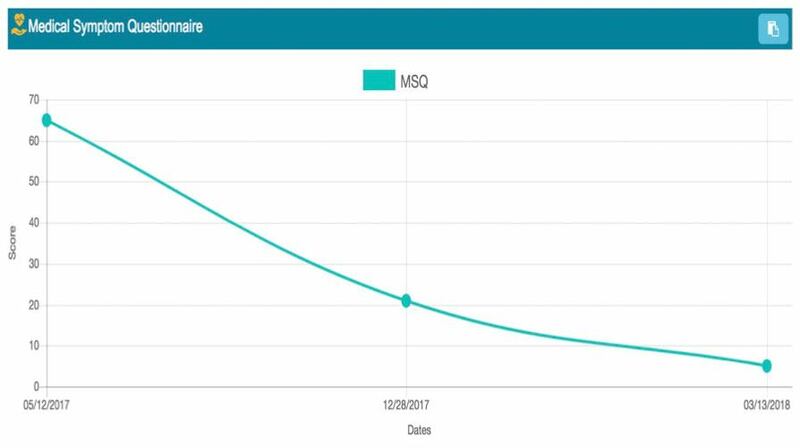 The beauty of the MSQ score comes from the visual image (graph-like) created for patient to follow their progress and notice how fast their condition is improving. They see their score start at high level and gradually comes down while they are pursuing their functional medicine treatment. MSQ Score is also available in The Vitality Clinic Website under the heading of health form. Website visitors can complete the health form (MSQ questionnaire) for no cost. Doing that they receive a mini medical report giving total MSQ score, individual system scores and the main symptoms. They also get an advice on how to take this matter further. Please help yourself by completing the Health form now. We will come back to you with a mini medical report, within 24 hours. You get this service together with a 15-minutes telephone Conversation, absolutely for free.